As you know The Brand Surgery® is an ethical branding agency and we work hard to Create Shared Value as part of our Corporate Social Responsibility strategy. This year, we have chosen Thyroid UK as our chosen charity, mainly because our MD suffers with an under-active thyroid (hypothyroidism) so this subject is close to her heart, or should we say her throat! Thyroid UK raises awareness for natural thyroid solutions over widely prescribed levothyroixine. The thyroid produces two hormones, thyroxine (T4) and tri-iodothyronine (T3). The standard medication for hypothyroid patients is levothyroxine (T4) but in up to 16% of patients, this medication does not relieve their symptoms. 23% asked for natural desiccated thyroid and 92% were refused this treatment with the main reasons being ‘lack of knowledge’ (about the medication) and ‘no evidence of superiority over levothyroxine’. 27% of the respondents asked for T3 but 72% were refused, the main reasons being, once again, ‘lack of knowledge’ (about the medication) and ‘no evidence of superiority over levothyroxine’. 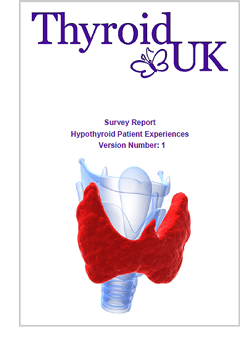 The Survey Report Hypothyroid Patient Experiences is essential reading for thyroid patients. The Brand Surgery® is creating shared value by offering marketing and promotions expertise to help to spread the thyroid message. If you know anyone with thyroid issues, please advise them to visit Thyroid UK’s website for ideas to spread the message, including writing a letter to your MP and sending the Thyroid UK press release to your local paper. Are you affected? Has the medication you have been taking affected you? Share your story to help us promote awareness.